Not too long ago, we had Andy falling down from the heavens after having performed exceptionally well for years, yet unable to topple the World's Number 1 player in slams. He'd get close, but fall a tad short. Slowly, he'd fall behind the others too, and find himself looking up at additionally at five or eight up-and-coming players who would prove to be more than annoying obstacles. This time was no different. But Andy did what he did then: revamped his coaching staff, his support team, and his playing style. Even got engaged. He would announce this to the world, express confidence in his resurgence, and optimistically look forward to his next encounter with the top players. The result was the same for Andy this time, as it was then. He competed gamely for a while, going toe-to-toe with the champion, only to run into a buzz-saw and see an avalanche of breaks and easy holds, running up the score. Plus, he was exhausted at the end of it all. This time, the resistance lasted for 2+ sets. It was 6-7, 7-6, a break with a 2-0 lead in the third set in Andy's favor, when he came undone. 13 dazzling games followed, of which he won a mere one, and just like that, the champ won going away 7-6, 6-7, 6-3, 6-0. Eerily similar to the last time Andy was resurgent and had closed the gap, only to be served a harsh reminder that it was a chasm, not a gap. That was in 2007, and it was a different Andy. 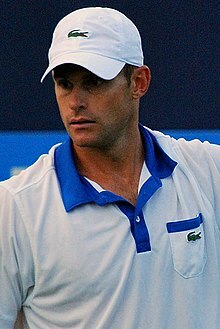 Roddick had similarly re-tooled himself, had hired Connors, worked on his offensive game, and had been winning, dismantling pretenders till he ran into the champion. He lost 6-4, 6-0, 6-2 on that day. True, it was only a semi-final, but the story-line was familiar. A hyped-up— not unfairly at that—resurgence, a well contested start, followed by an avalanche of brilliance from the champ, and a deflated ending. From 4-4 in the first set, Roddick lost 11 games in a row, and his confidence carefully built up from recent successes, shattered. On both instances, Andy had run into a master, someone at the zenith of his powers. For one who believed that match was the epitome of Federer's mastery, this was Djokovic's. It had all the elements: exceptional stamina, resilience when injured, laser-guided returns, and sublime court-coverage with heretofore unseen fitness. So this gets Djokovic to eight slams, and imprints the Australian slam as his own. Nadal has the French Open, Federer the US Open and Wimbledon, and now a long associated member of the Big Three has his. Even if this is the least glamorous of the slams, it cements his legacy in the upper echelons. Given that he is in the midst of his peak, this should catapult him to the stratosphere of double-digit slams. As it appeared in 2007, it does so too in 2015 that if the reigning champ were to solve the clay puzzle known as Nadal, the calendar year slam would be his for the taking. It is now more probable than it was at any time since 2011. Given that Federer is older, and Djokovic is better than him today, Nadal is ailing, and is older and banged-up than he was then, he has a real shot. Even otherwise, Djokovic showed that he belongs more to the Big Three than Murray does to the Big Four.